The Cape Town transport network is getting a major overhaul. The newly developed Transport Development Index (TDI) places Cape Town at the lower end, ranking 73rd, of 85 cities worldwide. The TDI has been developed by the City of Cape Town Transport authority and compares the world's major cities' direct cost of transport, safety and flexibility of the public transport network and examines the safety and congestions on the cities' roads. Most of the local commuters use the minibus taxis, buses and metro rail as their daily transport. These results highlight the dire need to urgently improve and expand the city's transport network. In the recent report, it is stated, that the low and middle income groups use public Cape Town transport as their main means of commuting. 95% of the city's population are relying on public transport. The Cape Town Public Transport system, however, is not yet adequate for the increasing commuter numbers. Now plans are in discussion to increase volumes and reliability with an expanded bus rapid transport network and new X'trapolis Mega commuter trains are expected to easy the congestion from as early as the mid of 2016. For most long-term visitors such as interns or expats, however, own transport will be needed to get to work or manage the daily routine e.g. driving the children to school, going shopping or visiting friends. Daily commutes by car are tiring and some stretches of the road system are a big headache to all commuters. Almost 800,000 private cars are registered in Cape Town and more than 1,2 million passengers travel by private car daily. Travel times by car are often long when you live in the suburbs and your workplace is in the CBD, so you have to plan wisely and decide when and where to travel ahead of time. Before we give you some advise on how to get a car and what to know about driving in Cape Town, let us give you some more insights into public transport options. 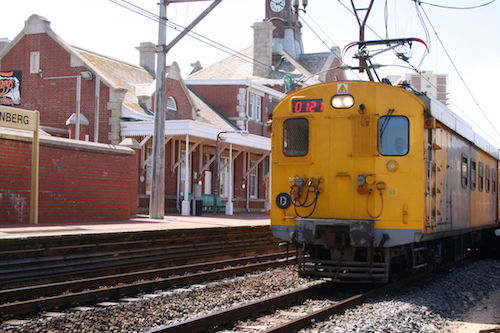 By Train: Some suburbs and nearby towns such as Muizenberg or Parow/Bellville are linked to the rail system which usually end in the newly refurbished Cape Town station. Train travel is usually safe during rush hours. Make sure to avoid empty compartments and best travel in groups. Metro-rail offers various routes. More here. By Bus: MyCiti bus rapid transport is expanding rapidly. Many suburbs and the main tourist attractions such as the V&A Waterfront are already linked to the main feeder service running between Table View and the Civic Centre main station or the airport route an the many services in and around the city centre. Various routes such as the Hout Bay route or the Atlantis route are currently under construction. You will need to buy a MyCiti card to pay for your trips. There are different peak/off-peak tariffs. Fare calculator here. By Taxi Cab: Travel in a limousine cab or metered taxi is definitely the easiest and most convenient way of getting around town, but more on the pricey side. However it is definitely worth to pay a few bucks more, if you need to get safely home from a pub-crawl at night or for transfer to the airport. Taxi cabs charge around R10 - R15 per km depending on the area. There are only a few taxi ranks around Cape Town at the major tourist sights and you usually will not be able to hail a taxi cab from the street therefore it is advisable that you pre-book a taxi. Taxis can be ordered from restaurants, hotels and shopping centers. Please do check the meter or arrange a rate beforehand not to be unpleasantly surprised. Uber has reached Cape Town too. Their drivers are monitored and registered. Get more info here. By Minibus Taxi: Minibus taxis operate mainly from/to townships and in the city centre. The minibus taxis can be hailed on the street and are paid per trip. These taxis often wait until a taxi is full. However, it is strongly recommended to only use minibus taxis when travelling with a local who is experienced in travelling by minibus taxis. By motorbike: Motorbike or scooter rental is possible in Cape Town, get in contact with Cape Bike Rentals to enquire about your best options. If you always wanted to ride a Harley Davidson, find out about your options here. For airport transfer book with airport shuttle companies which are operate from their own desk in the Central Hall at Cape Town International Airport as well as the City's own Myciti Rapid Transport Shuttle. Please check beforehand the price and check if you will be driven directly to your destination or the driver plans to wait for somebody else to join you for the trip. More info and reliable airport shuttle operator's contact numbers here. The MyCiti airport shuttle runs from Cape Town International Airport to Civic Centre in the CBD every twenty minutes. The trip to the city centre takes about half an hour depending on traffic and costs around R70 (depending on fare and discount options). Until the main bus routes are serviced in an interlinked network throughout the city, most of you will still need to rely on a car for your personal Cape Town transport. If you plan to live in Cape Town, you surely will consider buying at least one car for your family. When we moved to Cape Town we rented a car for the first two weeks and in this time we were very actively were looking for a suitable car for our expat family. Buying a car is surely the most popular option when considering your Cape Town transport and also cheaper than renting a car for a longer time. If you buy your first car here from a car dealer, they will usually arrange registration and licensing for you. Where and how to register your car and which documents you need, if you buy a car from a private person, find out here. Renting a car is also an option when looking for transport for a short amount of time. 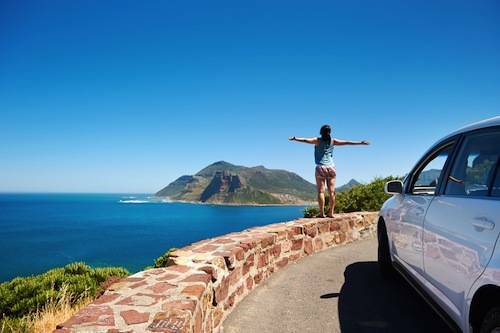 If you are looking for cheap car rental in Cape Town or want some advice on renting a car in Cape Town please read our tips here. You will need a valid driver’s license in English here, so if yours is not in English you will have to get an International Drivers license from your country or you can try to get a translation of your license from your consulate. Signage is usually good and bilingual English and Afrikaans, but take care when you look for a street in the center of Cape Town and look for street names as they are given sometimes in Afrikaans wherever you will find them in your street directory only in English or vice versa, like Wale vs. Waal Street. Recently a number of roads and highways have been renamed. Read about Cape Town's renamed roads here. The destination signs give the distance in kilometers. Speed limits are set on all the roads. There are quite a lot of speed traps or cameras on various roads and traffic lights all over Cape Town. Tickets for speeding will be sent to the address where the car is registered. You can pay fines online. More info here. The official speed limits are between 60kmh (35mph) and 80kmh (45mph) in the city and 120kmh (75mph) on all open roads and the motorways like the N1, N2 or N5. Parking can be found easily in the city center in parking arcades or in marked street parking zones. When parking on the side of a street never park on yellow lines as you car most likely will be clamped or towed away. Official park attendants usually show you to an open parking spot and then will register your car on their hand-held computer system. Usually you pay upfront the standard amount of R9-12 per hour. Petrol is cheaper n South Africa than in many places around the world. Petrol attendants will fill your tank, wash your windows or check your car's oil and water levels. Pay cash or get a garage card from your bank to pay for petrol and garage services. Credit cards are usually accepted as method of payment at the filling stations nowadays too. Allow gratuity R5-10 for good service. Road-closures do happen due to construction work and other circumstances. Make sure to check this page on current road-closures. For some important Cape Town transport information on what to do and what to take special care of when driving in the Mother City please refer to our advice on driving in South Africa, a page about the basics on driving your own car in Cape Town and special traffic rules you should know when driving here. Air transport is the most convenient and time effective way to go if you want to venture further away from the Mother City and want to travel around South Africa quick and easy. Air transport will often come quite cheap in South Africa, as low-cost airlines, like Mango or Kulula or FlySafair are operating. Read more about airlines operating flights to Cape Town and in between South African cities here. Inter city Bus Services like Intercape and Greyhound service not only the Wider Cape Town area but also cities and towns in the Western Cape and link the Mother City to many cities across South Africa. The air-conditioned 'luxury' buses operate routes to all major South African cities. The Baz Bus, a backpacker bus service, is a popular alternative used by many young travellers and includes many stops along scenic routes. Train travel with the famous Blue Train for Cape Town to Pretoria or the Shosholoza Meyl are comfortable and exciting trips if you travel between Cape Town and Johannesburg or Cape Town to East London.